You are solely responsible for the content you are uploading, publishing or propagating to and through Healthigo and it’s services. You may not Upload, publish or propagate any content that is offensive to the general public, or offends the religious sentiments of the people of UAE or is pornographic in nature or is illegal in any manner according to the existing laws of UAE. You understand that the technical processing and transmission of the Service, including your Content, may be transferred unencrypted and involve (a) transmissions over various networks; and (b) changes to conform and adapt to technical requirements of connecting networks or devices. You expressly understand and agree that Company shall not be liable for any direct, indirect, incidental, special, consequential or exemplary damages, including but not limited to, damages for loss of profits, goodwill, use, data or other intangible losses (even if Company has been advised of the possibility of such damages), resulting from: (i) the use or the inability to use the service. In no event shall Company liability to you exceed the amount actually paid to Company by you during the preceding 12 months of active usage of Services. End user shall be responsible for obtaining and maintaining all telephone, computer hardware and other equipment needed for access to and use of this Site and all charges related thereto. Healthigo.com shall not be liable for any damages to the End user’s equipment resulting from the use of this Site. Minors under the age of 18 shall be and are prohibited to register as a User of this website and are not allowed to make any transaction or use the website. You must provide your legal full name, valid license if registering a business or professionalentity, a valid email address, and any other information requested in order to complete the signup process. You are solely responsible for secure access of all content and data related to your account. Company cannot and will not be liable for any loss or damage from your failure to comply with this security obligation. You may not use the Service for any illegal or unauthorized purpose. You must not, in the use of the Service, violate any laws in your jurisdiction (including but not limited to copyright laws). Any dispute or claim arising out of or in connection with this website shall be governed and construed in accordance with the laws of UAE. A valid credit/debit card or bank account is required. We accept payments online using Visa and MasterCard credit/debit card in AED If you make a payment for our products or services on our website, the details you are asked to submit will be provided directly to our payment provider via a secured connection. The cardholder must retain a copy of transaction records and Merchant policies and rules. There will be no refunds or credits for setup fees, partial months of service, upgrade/downgrade refunds, or refunds for months unused with an open account. In order to treat everyone equally, no exceptions will be made. All fees are exclusive of all taxes, levies, or duties imposed by taxing authorities, and you shall be responsible for payment of all such taxes, levies, or duties. Company will use commercially reasonable efforts to have custom mobile applications approved by the appropriate mobile platform provider. Although there is a high likelihood of approval, we do not and cannot guarantee acceptance. If your application is denied by the appropriate mobile platform provider you may cancel your account, however there are no refunds under any circumstances. You are solely responsible for properly canceling your account. All of your Content will be deleted from the Service upon cancellation. This information cannot be recovered once your account is cancelled. If you cancel the Service before 30 working days from the end of your current paid up period, your cancellation will take effect immediately and you will not be charged again. Company, in its sole discretion, has the right to suspend or terminate your account and refuse any and all current or future use of the Service, or any other Company service, for any reason at any time. Such termination of the Service will result in the deactivation or deletion of your Account or your access to your Account, and the forfeiture and relinquishment of all Content in your Account. Company reserves the right to refuse service to anyone for any reason at any time. If for whatever reason you are unsatisfied with the Services (as described by Company) within the first month of service, Company guarantees to adjust the first month of service with an additional month of service with no questions asked. Services are backed by a 100% satisfaction guarantee. This guarantee does not apply to months after a full month of service has passed and only applies to the initial month of service with Company. Company reserves the right at any time and from time to time to modify or discontinue, temporarily or permanently, the Service (or any part thereof) with or without notice. Company shall not be liable to you or to any third party for any modification, price change, suspension or discontinuance of the Service. From time to time, Company may issue an update to the Services which may add, modify, and/or remove features from the applications. These updates may be pushed out automatically with little or no notice, although Company will do everything in its power to notify you in advance of an upcoming update, including details on what the update includes. The Services will be subject to a pay as you go plan, monthly, bi-annual or annual subscription fees. Once you have completed your free trial period, you will be notified via email of the termination of your free trial period and your access to your account will be suspended unless you take a pay as you plan, monthly, bi-annual, or annual subscriptions. Monthly, bi-annual or annual subscriptions are billed monthly, bi-annually or annually respectively, in advance according to the Fee Schedule selected by you at sign up. Monthly, bi-annual or annual send credits expire at the end of each period (monthly, bi-annually or annually), but Non-expiring Extra Credits do not. Pay as you go credits must be prepaid and do not expire. The Fee Schedule, including subscriber levels and prices, are subject to change at any time. Payment of your Healthigo subscription or plan must be made by a valid credit card accepted by Healthigo using the Payment Tech transaction system. For monthly, bi-annually or annual subscriptions you hereby authorize Healthigo to charge your credit card for such amounts on a regular basis, generally on the renewal date of your Subscription to Healthigo. Fees are payable in AED. If Healthigo, for any reason is unable to effect automatic payment via your credit card, you will be notified via email and your Healthigo account will be disabled until payment is received. Refunds - given at least five (5) business days’ notice in writing, Healthigo may offer a refund, at its discretion. Cancellation and subscriptions changes – you may cancel, upgrade or downgrade your subscription at any time. If you wish to upgrade or downgrade your periodic subscription you may do so by contacting our Billing Department, or you can manually do it in your account. Cancelations must be done five (5) business days prior to your next billing date to avoid further charges. Healthigo staff will charge AED 300 per every 30 minutes for any walk-through process over the phone or live chat that is explained in any of our help sections including Manuals, Q.A., Tutorials and others. The Fee Schedule is subject to change at any time. To qualify for the Non-Profit discount you must be registered as a not-for- profit organization, a club, membership organization, charity, or cultural group. We require that you submit the appropriate legal documents from the corresponding country to our Sales Department. Healthigo lets you upload up to 20 mailing lists, each with up to 250,000 contacts. You can add additional mailing lists at an extra cost. In addition to the credits provided by your Periodic plan, you may also purchase Non-Expiring Extra Credits whenever you need them. They rollover, and can be used at any time as long as your periodic membership is active. We claim no intellectual property rights over the material you provide to the Service. Your profile and materials uploaded remain yours. However, by using the Services and applications, you agree to allow others to view and share your Content. Company does not pre-screen Content, but Company and its designee have the right (but not the obligation) in their sole discretion to refuse or remove any Content that is available via the Service. The look and feel of the Service is copyright 2017 nTegra. All rights reserved. You may not duplicate, copy, or reuse any portion of the content, data, HTML/CSS or visual design elements without express written permission from Company. Company may make certain software available to you through the Service. If you access, download or otherwise use the software from the Service, the software, including all files and images contained in or generated by the software, look and feel, HTML/CSS, visual design elements, and accompanying data (collectively, “Software”) are deemed to be licensed to you by Company, for your personal and noncommercial use only. Company does not transfer either the title or the intellectual property rights to the Software or Services, and Company retains full and complete title to the Software and Services as well as all intellectual property rights therein. You may not sell, redistribute, or reproduce the Software or Services, nor may you decompile, reverse-engineer, disassemble, or otherwise convert the Software to a human-perceivable form. You grant Company a license to use the materials you post to the Services. By posting, downloading, displaying, performing, transmitting, or otherwise distributing user content to the Service, you are granting Company, its affiliates, officers, directors, employees, consultants, agents, and representatives a license to use user content in connection with the operation of Company and Services, its affiliates, officers, directors, employees, consultants, agents, and representatives, including without limitation, a right to copy, distribute, transmit, publicly display, publicly perform, reproduce, edit, translate, and reformat user content. You will not be compensated for any user content. By posting user content on the Service, you warrant and represent that you own the rights to the user content or are otherwise authorized to post, distribute, display, perform, transmit, or otherwise distribute user content. All Company and Services content included on its sites, its Software and Applications, and through the Services is the property of Company and is protected by international intellectual property laws. All Company content, Software, code, HTML/CSS, and visual design data is copyright 2017 NTEGRA. (ii) the accuracy, reliability or content of any information, service or vouchers provided through this site or the microsites. This site and the microsites are made accessible on an “as is” and “as available” basis. Healthigo.com hereby disclaims any and all representations, warranties and conditions, whether express or implied, including, but not limited to, those of title non-infringement, merchantability, and fitness for a particular purpose. In no event shall Healthigo.com, be liable for any indirect, incidental, special, consequential or punitive damages arising out of or related to this agreement. In no event will Healthigo.com’s liability in connection with a Healthigo.com exceed the amounts paid for such Healthigo.com, and total aggregate liability arising out of or related to this agreement shall not exceed the amounts paid by end user during the six months preceding the bringing of any claim. Healthigo.com shall have the right, but not the obligation, to monitor the content of the Site and any Microsites at all times, including any chat rooms and forums that may hereinafter be included as part of the Site, to determine compliance with this Agreement and any operating rules established by Healthigo.com, as well as to satisfy any applicable law, regulation or authorized government request. Without limiting the foregoing, Healthigo.com shall have the right, but not the obligation, to remove any material that Healthigo.com, in its sole discretion, finds to be in violation of the provisions hereof or otherwise objectionable. By posting communications on or through this Site or any Microsite, End user shall be deemed to have granted to Healthigo.com a royalty-free, perpetual, irrevocable, non-exclusive license to use, reproduce, modify, publish, edit, translate, distribute, perform, and display the communication alone or as part of other works in any form, media, or technology whether now known or hereafter developed without territorial or time limitations, and to sublicense such rights through multiple tiers of sub licensees. Healthigo.com may terminate this Agreement at any time. Without limiting the foregoing, Healthigo.com shall have the right to immediately terminate or suspend any passwords or accounts of End user in the event of any conduct by End user or which Healthigo.com, in its sole discretion, considers to be unacceptable, or in the event of any breach by End user of this Agreement. Healthigo.com is a trademark of nTegra Global Technologies FZ-LLC. All rights in respect of this trademark are hereby expressly reserved. Unless otherwise indicated, all other trademarks appearing on Healthigo.com are the property of their respective owners. Healthigo.com, similar to an Internet Service Provider, is a distributor (and not a publisher) of content supplied by third parties and End users. Accordingly, Healthigo.com has no more editorial control over such content than does a public library, bookstore or newsstand. 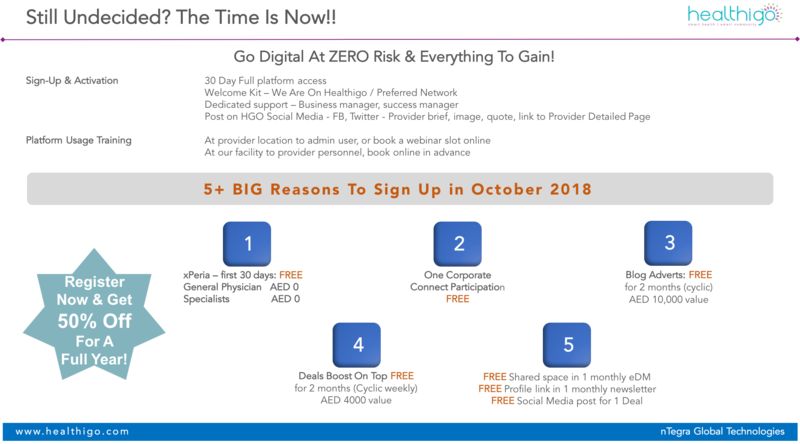 Any opinions, advice, statements, services, offers, or other information or content expressed or made available by third parties, including information providers, or any other end users are those of the respective author(s) or distributor(s) and not of Healthigo.com. In many instances, the content available through this Site represents the opinions and judgments of the respective information provider, end user, or other user not under contract with Healthigo.com. Healthigo.com neither endorses nor is responsible for the accuracy or reliability of any opinion, advice, or statement made on Healthigo.com by anyone other than authorized Healthigo.com employee spokespersons while acting in official capacities. Under no circumstances will Healthigo.com be liable for any loss or damage caused by an end user’s reliance on information obtained through Healthigo.com. It is the responsibility of End user to evaluate the accuracy, completeness, or usefulness of any information, opinion, advice, etc., or other content available through Healthigo.com. Healthigo.com contains links to third-party websites maintained by other content providers. These links are provided solely as a convenience to you and not as an endorsement by Healthigo.com of the contents on such third-party sites, and Healthigo.com hereby expressly disclaims any representations regarding the content or accuracy of materials on such third- party websites. If End user decides to access linked third-party websites, End user does so at its own risk. Unless you have executed a written agreement with Healthigo.com expressly permitting you to do so, you may not provide a hyperlink to the Site or any Microsite from any other website. Healthigo.com reserves the right to revoke its consent to any link at any time in its sole discretion. This Agreement, including the Terms of Sale set forth below (which are incorporated into this Agreement), and any operating rules for Healthigo.com established by Healthigo.com, constitute the entire agreement of the parties with respect to the subject matter hereof. No waiver by either party of any breach or default hereunder is a waiver of any preceding or subsequent breach or default. The section headings used herein are for convenience only and shall be of no legal force or effect. If any provision of this Agreement is held invalid by a court of competent jurisdiction, such invalidity shall not affect the enforceability of any other provisions contained in this Agreement, and the remaining portions of this Agreement shall continue in full force and effect. The failure of either party to exercise any of its rights under this Agreement shall not be deemed a waiver or forfeiture of such rights or any other rights provided hereunder. any claim, dispute, or controversy End user may have against Healthigo.com arising out of, relating to, or connected in any way with this Agreement, this Site, or any Microsite, or the purchase or sale of any Voucher(s), shall be resolved exclusively by final and binding arbitration administered by the Dubai International Arbitration Centre (“DIAC”) and conducted before a single arbitrator pursuant to the applicable Rules and Procedures established by DIAC(“Rules and Procedures”). the arbitrator shall apply English Law consistent with the Laws of the United Arab Emirates. There shall be no authority for any claims to be arbitrated on a class or representative basis; arbitration can decide only the End user’s and/or Healthigo.com’s individual claims; and the arbitrator may not consolidate or join the claims of other persons or parties who may be similarly situated. All vouchers obtained from the Service or associated mobile apps, or any other website associated with Healthigo.com (hereinafter “Vouchers”) are promotional vouchers that may be posted by participating merchants (“Merchants”) through Healthigo.com to be used in exchange for goods and services at a discount from their actual cost. By choosing to utilize a Voucher from a Merchant through Healthigo.com, you agree to the terms and conditions stated in this document. You are required to create an account in order to avail any Voucher. This is required so we can provide you with easy access to print your orders, view your past purchases, modify your preferences, and to ensure permissible use of the Voucher. The Voucher you purchase through Healthigo.com is redeemable for goods or services by the Merchant. The Merchant, not Healthigo.com, is the seller of the Voucher and the goods and services and is solely responsible for redeeming any Voucher you purchase. Healthigo.com promotes a Voucher that can be redeemed in connection with your purchase of the goods or services from Merchant. All Vouchers shall be subject to the terms and conditions of Healthigo.com and the participating Merchant. The Merchants are the sellers of the goods or services which you are purchasing. 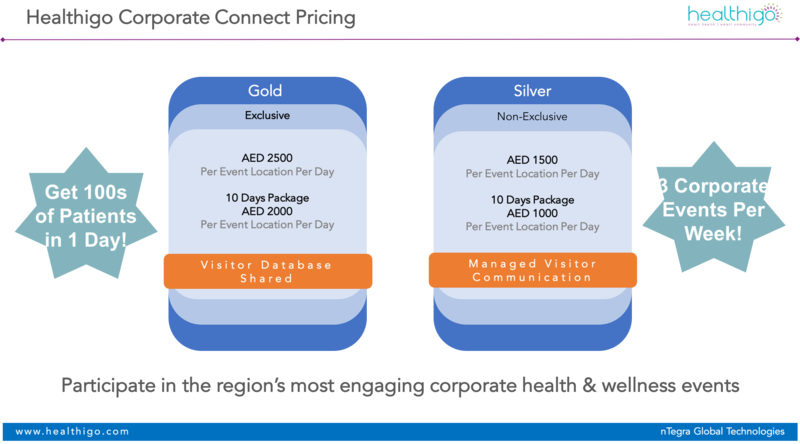 All monetary transactions made by customers on Healthigo.com.ae are handled by Company. As a holder and issuer of the Voucher, the Merchant shall be fully responsible for any and all injuries, illnesses, damages, claims, liabilities and costs suffered by or in respect of a customer, caused in whole or in part by the the Merchant, as well as for any unclaimed property liability arising from unredeemed Vouchers or portions thereof. You waive, and release Healthigo.com and its officers, directors, employees and agents from, any claim, liabilities, damages, or injury arising from or related to any act or omission of Merchant in connection with a Voucher or the services/goods provided in connection therewith and/or as it relates to compliance with applicable unclaimed property and other laws relating to the redemption of the Vouchers or any portion thereof. Merchant Vouchers are redeemable in their entirety and on a one-time basis only and may not be redeemed incrementally. Neither Healthigo.com nor the Merchant is responsible for lost or stolen Vouchers or Voucher’s reference number. Reproduction, sale or trade of this Voucher is prohibited unless done so in compliance with applicable law. Any attempted redemption not consistent with these terms and conditions will render the Voucher null and void. 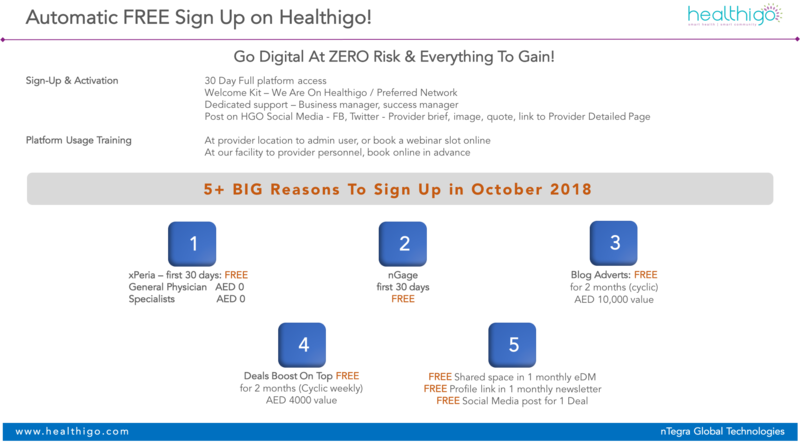 Healthigo provides businesses operators a software application to create, launch, and manage online email marketing campaigns and HTML newsletters. The Services are available only to businesses who can form legally binding contracts and subscribe to Healthigo Service. You agree you will not access or otherwise use third party mailing lists in connection with preparing or distributing unsolicited email to any third party. You here by agree to indemnify and hold harmless Healthigo against any damages, losses, liabilities, settlements, and expenses (including without limitation costs and reasonable attorneys' fees) in connection with any claim fraction that arises from an alleged violation of the foregoing or otherwise arising from or relating to your use of Healthigo. Although Healthigo has no obligation to monitor the content provided by you or your use of the Services, Healthigo, may do so and may remove any such content or prohibit any use of Healthigo, if it believes it is (or is alleged to be) in violation of the foregoing. Every email message sent via Healthigo must contain an "unsubscribe" link that allows visitors to remove themselves from your mailing list. You agree that you will not remove, disable or attempt to remove or disable either link. Healthigo may immediately disable your access to Healthigo if you violate this restriction. The Services may only be used for lawful purposes. Transmission or solicitation of any material that violates the United States federal or state law, the European Community, or other laws that may apply in your local area is prohibited. This may include material that is obscene, threatening, harassing, libelous, or in any way a violation of intellectual property laws or a third party's intellectual property rights. For every email message sent in connection with the Services, you acknowledge and agree that the Services may automatically add an identifying footer stating "Powered by Healthigo"- try us free. You agree to cooperate with and provide reasonable assistance to Healthigo in promoting and advertising Healthigo. Healthigo will not share information you may upload (such as email addresses, name, contact information, or other registration information). 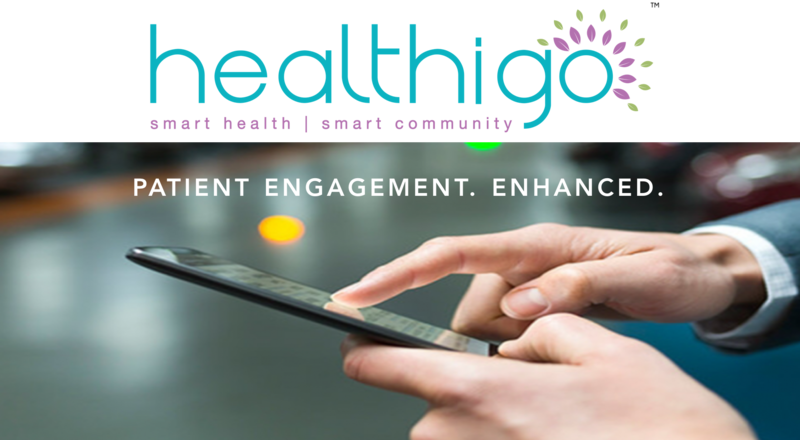 Healthigo may use this information and any technical information about your use of the Services to tailor its presentations to you, facilitate your movement through the Service, or communicate separately with you. If you licensed the Services as a result of solicitation by a Reseller or Franchise of Healthigo, Healthigo may share your information with the Reseller or Franchise. Healthigo will not use your customer list or any other customer information for any other purposes than those intended with the service. Your customer information will not be shared with any other parties. Healthigo will not use your customer information for the purpose of sending unsolicited commercial email. Healthigo requires all new accounts to be reviewed by the Healthigo staff in order to verify that no spam and/or illegal contents will be sent through our network. A hold limit for sending may be placed in the account until the reviewing process is completed. You represent to Healthigo and unconditionally guarantee that any elements of text, graphics, photos, designs, logos, trademarks, or other artwork furnished to Healthigo for inclusion in a personalized template created by Healthigo for you are owned by you, or that you have permission from the rightful owner to use each of these elements, and will indemnify, hold harmless, protect, and defend Healthigo and its Related Parties (as defined below) from any claim or suit arising from the use of such elements furnished by you. If your account is terminated due to Spam Complaints and/or fraud, amounts previously charged will not be refunded under any circumstances. By accessing the service you agree to pay the Service Charges applicable to the particular Service. No refunds will be offered for any SMS that is not received by intended recipient or are not sent correctly in accordance with the Service requirements. Should you believe a refund is warranted or should you have any issues or complaints regarding the Services please contact our Customer Care service. By using the service, you warrant that all information submitted by you is true, current and complete. Healthigo.com accepts no responsibility for any error, omission, interruption, deletion, defect, delay in operation or transmission or communications line failure, relating to the service. Sellers (you) who want to register on www.Healthigo.com (the Site or we or us or our), and use our services to sell products must accept these Seller Terms and Conditions (Terms). By creating a Seller account with us, you agree to be bound by these Terms, and all policies, guidelines, and other terms incorporated on the Site (Site Terms). We offer the web and mobile platforms for Sellers to offer products to end users, and complete transactions. Healthigo provides you with technology and services such as order management, fulfilment, all shipping and handling, cash collection and processing of payment, and call centre and customer support (Services). As a Seller, you use the Site and the Services at your own risk, and Healthigo bears no risks relating to your products, and all rights and liabilities therein. Seller registration process will result in creation of a Seller account with us. We may also assist Sellers for creating an account after receiving necessary information. You must first familiarise with the sale process set out on the Site and all Site Terms. (iv) remain responsible for after-sales services, guarantees and maintenances, and defects. Products that are hazardous to health and safety will require additional warranties, and higher safety standards as may be required by the federal or local government or law enforcement agencies. Liabilities for not following relevant safety and health requirements or selling products hazardous to individuals or properties will be at your sole risk and cost. We will reject products that fall under our Restricted items list. (iii) all other IPRs and equivalent or similar forms of protection existing anywhere in the world) or any other rights of any third party or any Applicable Laws, Healthigo may remove such products from the Site at its sole discretion or ask Seller to remove such products within a reasonable timeframe notified in writing. Seller acknowledges that Healthigo may from time to time introduce and implement new business rules, and customer care guidelines. Additionally, we are under no obligation to provide any information, material or document back to you, including following termination of these Terms or cancelation of a Seller account. You can verify sales reports for each calendar month through Seller account and the report will include the amount successfully collected for your products minus Healthigo’s fees. In most cases, a Seller or a purchaser will incur shipment charges. Shipment charges incurred by Healthigo if any will be adjusted. Seller is responsible for payment of taxes in connection with the products including interests, collection or withholding costs associated. All such amounts are in addition to Healthigo fees. Cost of each item minus Healthigo fee as set out on the Site will be released to Sellers’ account on the Site within 15 Business Days after successful products delivery, and not later than 30 days. This period will always be subject to any purchaser dispute or conflict resolution time. Thereafter, Sellers can transfer such balance to his/her bank account at any time. Our obligation to remit funds received by us on your behalf is limited to funds that we have actually received less amounts owed to Healthigo, subject to chargeback or reversal or withheld for anticipated claims in accordance with these Terms. The parties shall endeavor to resolve all and any payment conflicts amicably, and in the absence of an acceptable resolution. (iii) pay a penalty of AED 50,000 (Fifty Thousnd United Arab Emirates Dirhams) immediately; if (a) a Seller’s product was found to be not original or refurbished and or counterfeit; and (b) any fraudulent conduct was identified on the part of Seller. (vii) seller will neither sell nor deliver to a purchaser a refurnished or used item, and that the products will be always new. Seller agrees to reimburse Healthigo any fines or fees imposed on Healthigo by a relevant authority for breach of these warranties. Healthigo also reserves the right to withhold payment of any fees due to Sellers in such cases. Seller shall also immediately compensate the purchaser(s) with the value of the purchased item and shall return any unacceptable products at its own cost. Products sold on the Site are subjected to a return policy that is within 15 (fifteen) calendar days of the date of delivery as long as products are in the original packaging, and original condition when purchased and received except in cases a product is counterfeit or defective and/ or materially different from the one ordered by a purchaser. Our customer support team will arrange return for Seller by arranging a courier pick-up and return, at which point full refund is made to a purchaser. Seller must accept return of an item without fail. In the event of a return not in breach of a Seller obligations under this provision, Healthigo will not levy any costs or penalty. Nevertheless, Healthigo may levy shipping charges on Sellers if products are returned due to Seller’s breach of these Terms or Site Terms. Notwithstanding these Terms, returned products if not accepted by Seller after two attempts by Healthigo will be held in Healthigo’s custody for 60 (sixty) days from the date of receipt for Seller to take delivery. After this period, Healthigo retains the right to destroy products at its own discretion, and Seller will exhaust rights in the products including any fees, revenues or price. All auctioneers and bidders at Healthigo.com Auctions acknowledge that they have read these terms and conditions of sale and agree to be bound thereby. If you do not understand any of these terms or conditions, please ask Healthigo customer care for clarification before registering. All purchasers are required to have a Bidder’s Number to bid and shall supply Healthigo.com Auctions with their full name, address and telephone number. A form of picture identification is required to verify information. Healthigo reserves the right to withdraw from sale any of the items listed or to sell at this auction items not listed, and also reserves the right to group one or more lots into one or more selling lots or to subdivide into two or more selling lots. Healthigo shall not be responsible for the correct description, authenticity, genuineness of, estimated selling price of, or defect in any lot, and makes no warranty in connection therewith. No allowance will be made or sale set aside on account of any incorrectness, error in cataloguing, or any imperfection not noted. No deduction will be allowed on damaged articles as all goods being exposed for public exhibition are sold “as is” and without recourse. Auctioneer may post their products free of cost alongwith relevant details. Healthigo will be eligible to be paid a percentage of the highest bid amount. On receipt of the percentage due, Healthigo will release the contact details of the 3 highest bidders to the Auctioneer. Healthigo is not responsible for any transactions after release of bidder’s contacts to the auctioneer. Subscribers may post classified advertisement in relevant sections as per the pricing policy. Upon receipt of prepayment, Healthigo will activate your prepaid listing account and credit your account with the agreed number of listings and you will be authorised to list on the Website. Once the number of listings posted reaches the agreed limit or the account time period expires (whichever occurs first) you will no longer be able to list on the Website. If Healthigo does not receive a periodic payment when due, it reserves the right to suspend your account(s) and/or remove all Paid Content posted using any of your accounts until the arrears are brought fully up to date including in respect of any charges or processing fees reasonably incurred by Healthigo as a result of your non-payment. Thank you for registering with Healthigo! Download and explore our Mobile App through the link sent to your Registered Mobile Number ! Welcome, just one more step! Healthigo is currently programmed to work flawlessly with Google Chrome 64 or later versions only! We regret any inconvenience caused due to this and assure you that our team is working Day and Night to make Healthigo compatible with every browser at the earliest. 1. Confirmations of participation to be shared with Healthigo minimum 10 days prior to event. 2. Payment for chosen participation to be remitted no later than 2 days before the event date. 3. All Brand Sponsorships to be remitted minimum 7 days prior to event. 4. All give-aways/prizes to be delivered to Healthigo office at least 1 week prior to selected event date. 5. All marketing and branding details to reach Healthigo 7 days prior to event. 6. All relevant tests and consultations planned for the event should be communicated to Healthigo prior to event. 7. Details of members/doctors attending the event and their specialty to be communicated to Healthigo minimum 7 days prior to the event. 8. Tests need to be non-invasive. 9. Any Test results have to be given immediately. 10. 1 roll-up standee allowed at the booth. 11. All deal coupons and vouchers to be handed over 10 days prior to selected event date. 12. Permissions for deals/offers/promotions from concerned authorities to be taken by sponsors. A Copy of the permission to be submitted to Healthigo at least 2 days prior to the selected event date. 13. No participation will be possible without meeting statutory requirements. 1. Confirmation of participation to be communicated to Healthigo atleast 30 days prior to program. 2. 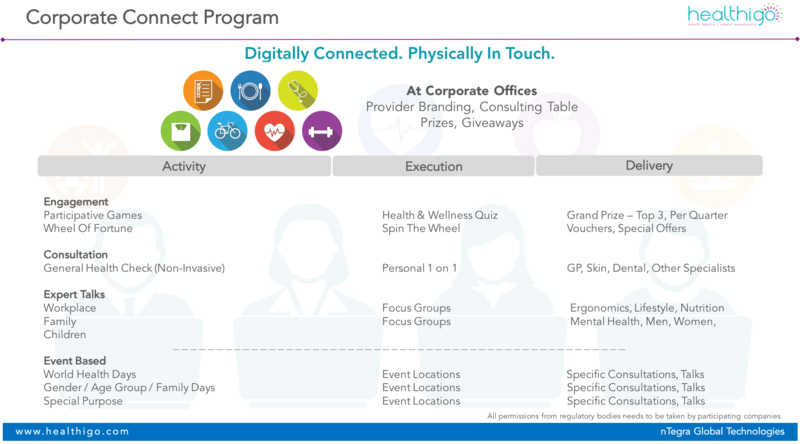 Corporate to provide for a separate area within their office, to accommodate the participants (Healthigo and the participating healthcare partner) on the day of the event/program. 3. Corporate to make necessary seating arrangements (minimum 3 tables and 10 chairs) for Healthigo and participating healthcare partners at the venue. 4. In the case of requirement of a Health Talk at the venue, the corporate to arrange for Audio - Video facility, separate area (preferably conference room) and confirmed attendance of minimum 50 employees. 5. Corporate to share the details of their current Insurance provider to Healthigo. 6. In the event of requirement of a gate pass to access the venue, the corporate to make necessary arrangements with the concerned officials/security atleast 2 days prior to the event. 7. 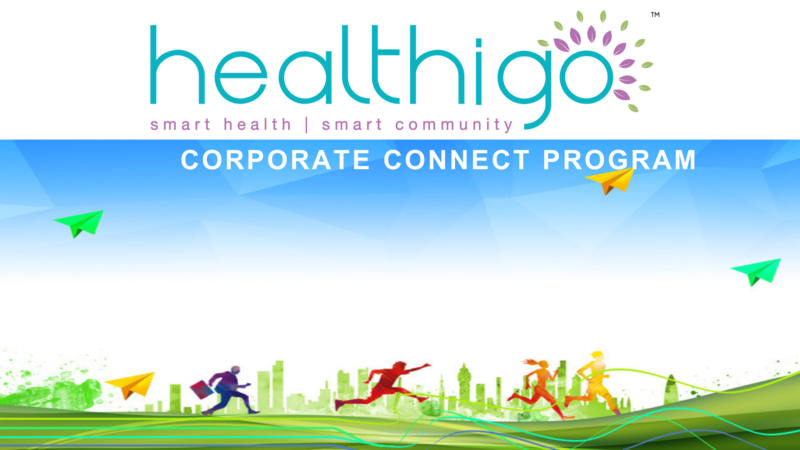 Healthigo will share a flyer/poster regarding the program, to the Corporate 3 days prior to the event. The Corporate to make necessary arrangement to circulate the same internally for communication to employees regarding the date and venue of the program to maximise participation. This section forms the Agreement between nTegra Global Technologies FZ-LLC (NTEGRA), a Dubai, UAE based company whose registered office is at 03, In5, Knowledge Village, Dubai, United Arab Emirates, owner of brand “Healthigo”; and, customer signed and subscribed as Business Subscriber Entity Name as mentioned on the face of this document (“Subscriber”). Scheduling Subscription :nTegra grants to Subscriber and Subscriber accepts from nTegra, a limited, non-exclusive, non-transferable right to access and use and permit Authorized Users to access and use the dashboard with limited services including Listing of Facility & Doctors, Managing & Displaying operation timings of the facilities, doctors, departments, services, etc., and collecting patients appointments for the referral fee for the duration that Subscriber has entered and agreed to pursuant to the sign up page for this Agreement. 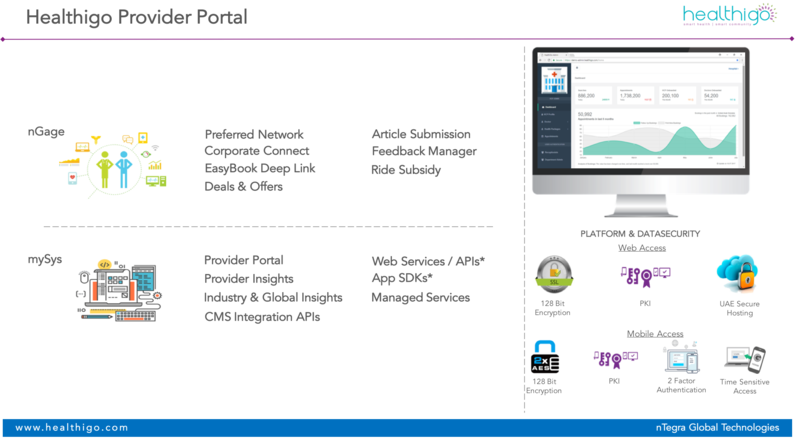 Engagement Subscription : nTegra grants to Subscriber and Subscriber accepts from nTegra, a limited, non-exclusive, non-transferable right to access and use and permit Authorized Users to access and use the complete dashboard except Managed Services & Add-Ons for the subscription fee for the duration that Subscriber has entered and agreed to pursuant to the sign up page for this Agreement. Upgrades & Add-Ons : Include any major releases of new versions, additional functionality, managed services and custom programming. 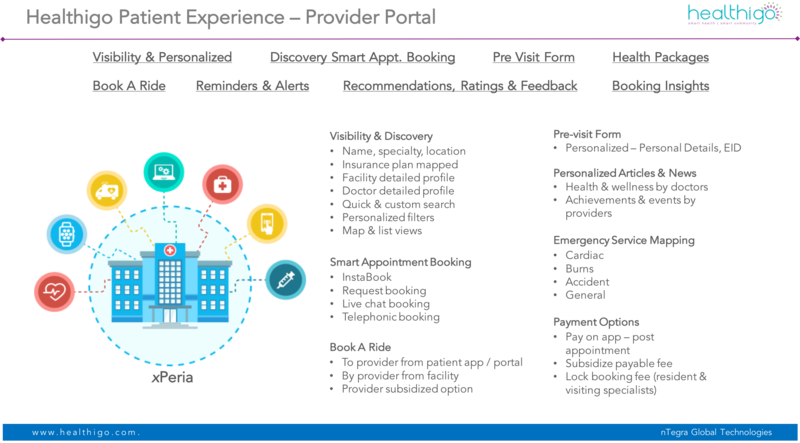 a) SOFTWARE PLATFORM NTEGRA : It has launched a subscription based service platform called Healthigo which can be utilized by the Subscriber for their patient engagement activities. The platform features are subject to change without prior notification. b) AGREEMENT TERMS : This Agreement includes 1 (One) calendar year of subscription to the Healthigo Platform from the date of signing this agreement. NTEGRA and Subscriber may enter into co-marketing activities in addition to the subscription to Healthigo platform. The Term of this Agreement shall commence on the Effective Date and shall continue until terminated as provided herein. Subscriber shall elect whether the term will consist of annual or monthly periods (each a “Subscription Period”). c) COST AND PAYMENT : The cost of subscription to the Healthigo Platform will be as signed off in accordance with the pricing section of this document. The payment may be made by Cheque / Bank Transfer as chosen and filled into this document. The Engagement Subscription Fee (either month or year, as applicable) of the term of this Agreement shall be paid on the Effective Date. The Referral and / or Subscription Fee for all Subscription Periods of the term of this Agreement shall fall due and payable on the first day of each subsequent Subscription Period, pursuant to subsection (F), below. The amount of the Subscription Fee does not include any applicable taxes. Client is responsible for any and all applicable taxes. 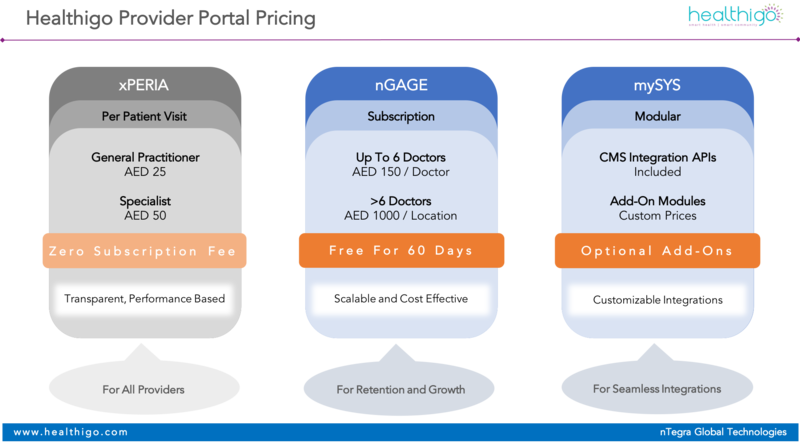 The pay-per-visit and subscription costs for each module are subject to change with a 15 day notice to subscriber prior to change in pricing. General Physician definition related to General Medicine only; does not relate to Dental, Cosmetic, etc. Please refer to exclusion list, available on request. d) MODULE ACTIVATION : The Scheduling module does not have a base subscription and is charged on actual patient visits only. The Engagement subscription is activated free of cost for an initial period of 60 days from the date of activation. Thereafter, if this module is not opted in for and paid for as per the described fees, access to this module would not be available and only access to the Scheduling module will continue. e) RENEWAL OF SUBSCRIPTION : The Subscription automatically stands renewed at the end of the active subscription period and the subscriber would need to pay for the renewed period of 12 calendar months. If the Subscriber chooses not to continue the Subscription beyond the active subscription period, they may do so by issuing a notice in writing to NTEGRA 30 days prior to expiry of subscription period. f) CANCELLATION : For Scheduling module subscriptions, the minimum committed contract period is 12 months. Subscriber can resolve any service issues with nTegra’s customer success team and if any issue is not resolved within a period of 30 days of reporting, the subscriber may cancel the subscription with no liabilities on either side. Subscriber may cancel subscription to the Engagement module at any time within the initial 60-day period without any charges. If opting in for the service, after the 60 day and during the 12-month subscription period, subscriber may cancel the subscription by issuing a notice in writing 30 days prior to expiry of subscription period. g) UPGRADE and ADD-ONS Subscriptions to add-on products and services can be upgraded at any time by paying the additional fee. h) REGULATORY APPROVALS AND FEES Any PERMISSIONS OR FEES arising out of publishing, offers or deals and advertisements on the Healthigo platform is the sole responsibility of the Subscriber. i) CONFIDENTIALITY AND PRIVACY : “Confidential Information” and “Trade Secrets” means any and all non-public information of any form, including but not limited to Intellectual Property, Copyright Material and Software Programs and processes, provided by or on behalf of to each other or to their representatives during the validity of this agreement and for a period of 2 years after cessation of this agreement. Both NTEGRA and SUBSCRIBER undertake to treat the Confidential Information and Trade Secrets as being strictly private to each party and shall not divulge, disclose or communicate either orally or in writing, in part or in whole, to any third party or use or exploit for any purpose, other than for the limited purpose for which it is conveyed, except with the prior written consent of each other. By signing this agreement, I / We certify that we have read all the terms, conditions and clauses outlined above and that we agree to the aforesaid terms and conditions in full and complete. Gold Subscription : nTegra grants to Subscriber and Subscriber accepts from nTegra, a limited, non-exclusive, non-transferable right to access and use and permit Authorized Users to access and use the dashboard with limited services including listing of employees, managing & displaying customized deals, articles, health packages, etc., for the duration that Subscriber has entered and agreed to pursuant to the sign up page for this Agreement. Platinum Subscription : nTegra grants to Subscriber and Subscriber accepts from nTegra, a limited, non-exclusive, non-transferable right to access and use and permit Authorized Users to access and use the modules for the duration that Subscriber has entered and agreed to pursuant to the sign up page for this Agreement. Upgrades : Include any major releases of new versions, additional functionality, managed services and custom programming. 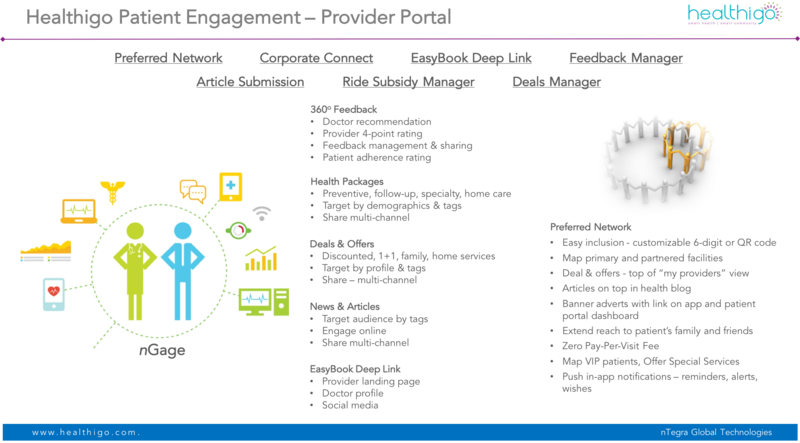 a) SOFTWARE PLATFORM : NTEGRA has launched a modular platform called Healthigo Connect which can be utilized by the Subscriber for their employee engagement activities. The platform features are subject to change without prior notification. 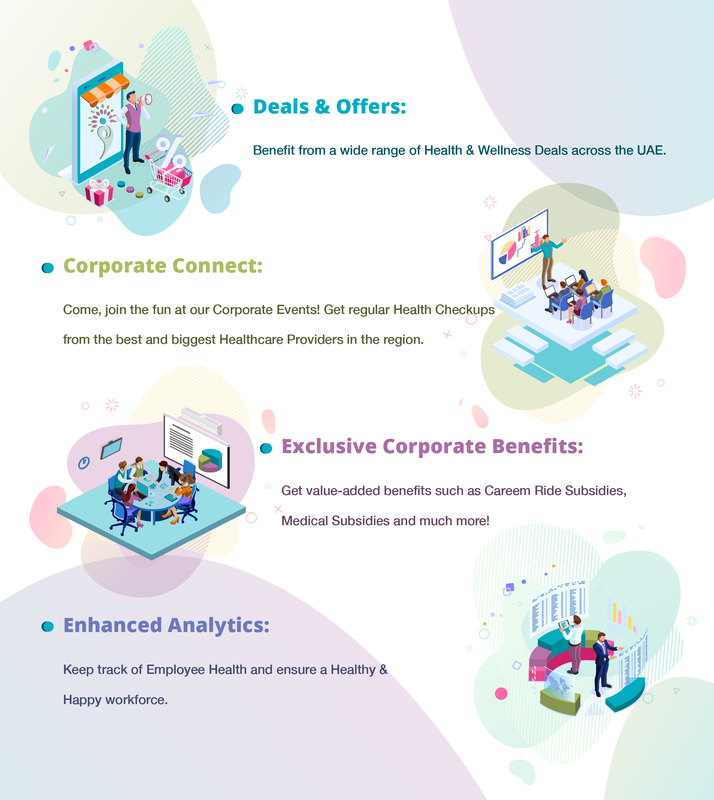 b) AGREEMENT TERMS : This Agreement includes 1 (One) calendar year of subscription to Healthigo Connect from the date of signing this agreement. NTEGRA and Subscriber may enter into co-marketing activities in addition to the subscription to Healthigo Prime. The Term of this Agreement shall commence on the Effective Date and shall continue until terminated as provided herein. Subscriber shall elect whether the term will consist of annual or monthly periods (each a “Subscription Period”). c) COST AND PAYMENT : The cost of subscription to Healthigo Connect will be as signed off in accordance with the pricing section of this document. The payment may be made by Cheque / Bank Transfer as chosen and filled into this document. The Platinum Subscription Fee (either month or year, as applicable) of the term of this Agreement shall be paid on the Effective Date. The Referral and / or Subscription Fee for all Subscription Periods of the term of this Agreement shall fall due and payable on the first day of each subsequent Subscription Period, pursuant to subsection (F), below. The amount of the Subscription Fee does not include any applicable taxes. Client is responsible for any and all applicable taxes. The module costs are subject to change with a 15 day notice to subscriber prior to change in pricing. d) MODULE ACTIVATION : The Gold module does not have a base subscription and is not charged. The Platinum modules is activated if this module is opted in for and paid for as per the described fees. Access to this module would not be available if this module is not opted for and only access to the Gold module will continue. f) CANCELLATION : For Gold module subscriptions, the minimum committed contract period is 12 months. Subscriber can resolve any service issues with nTegra’s customer success team and if any issue is not resolved within a period of 30 days of reporting, the subscriber may cancel the subscription with no liabilities on either side. For any of the Platinum modules, the terms and conditions of cancellation would need to be referred to the module description. g) SUPPORT SERVICES : NTEGRA will provide telephonic & web based support for all Subscriber requests. 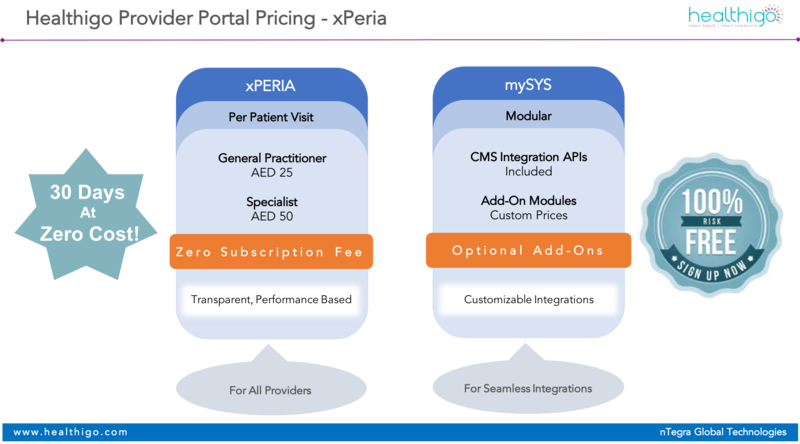 h) UPGRADE and ADD-ONS : Subscriptions to add-on products and services can be upgraded at any time by paying the additional fee. i) REGULATORY APPROVALS AND FEES : Any PERMISSIONS OR FEES arising out of publishing, offers or deals and advertisements on the Healthigo platform is the sole responsibility of the Subscriber. j) CONFIDENTIALITY AND PRIVACY : “Confidential Information” and “Trade Secrets” means any and all non-public information of any form, including but not limited to Intellectual Property, Copyright Material and Software Programs and processes, provided by or on behalf of to each other or to their representatives during the validity of this agreement and for a period of 2 years after cessation of this agreement. In order to Book an Appointment, please complete your profile by updating your email ID/Mobile Number.